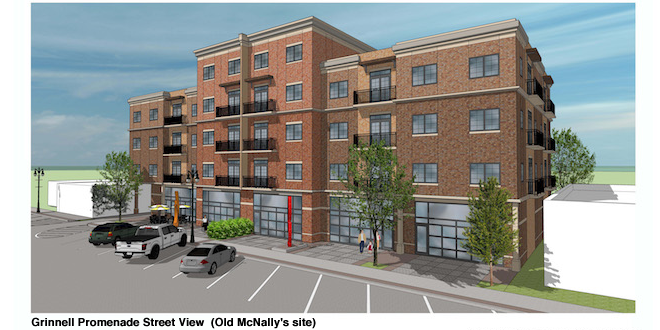 GRINNELL, Iowa — Principals of Grinnell Promenade LLC gave an updated presentation about the corporation’s proposed mixed-use development for the old McNally’s site during the Grinnell City Council meeting Monday night. 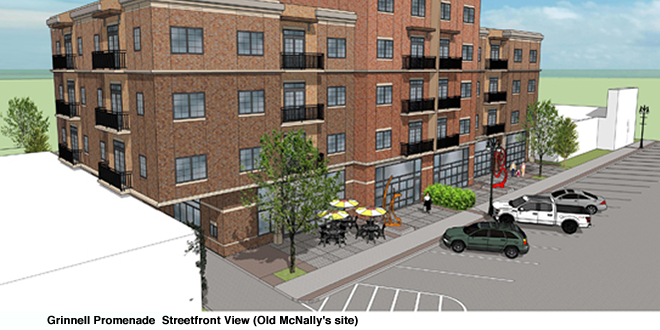 Grinnell Promenade is Grinnell College’s selected development partner for the former McNally’s site. 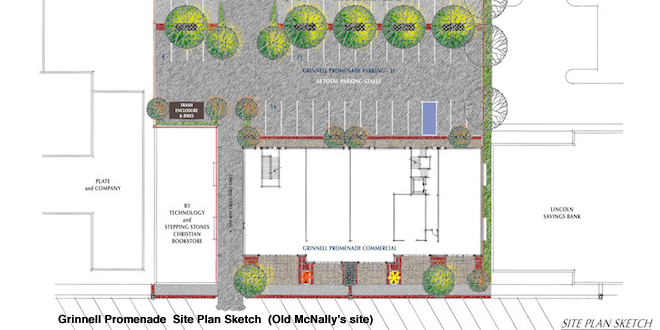 The College acquired and cleared the site last year to make the property available for construction in the Zone of Confluence, an area designated in an initiative to improve the social, cultural and economic vitality of the area between the downtown business district and the college campus. College officials are negotiating a long-term land lease for the property with Grinnell Promenade. Bill Ludwig and Stephen Brower showed new renderings of the planned Grinnell Promenade at 1021 Main St., which is planned to contain 30 apartments on the upper floors and 7,000 square feet of retail space on the first floor fronted by a large plaza area. The bulk of the structure remains four stories tall, although the center will extend to a fifth floor to accommodate two three-bedroom units with a loft design. Throughout the planning and design process, Grinnell Promenade has sought and incorporated input from the public. For example, the center front facade has been extended four feet toward Main Street to vary the depth of the front of the building, create more street-level interest and be more pedestrian-friendly. In addition, colors of the exterior brick have been altered to increase their resemblance to the colors of traditional downtown structures and to vary the shades of brick in different sections of the building. These changes will highlight various sections of the building and make it blend more with other downtown structures. The front plaza is expected to contain plantings, patio chairs and tables, as well as one or two public sculptures, again adding to pedestrian interest. Parking is another area where changes have been made as a result of public feedback. There will now be a total of 46 spaces, including one for each apartment, as well as city parking spaces along the back alley and in front of the building. To keep neighbors informed of the plans, Grinnell College and Grinnell Promenade representatives made joint visits to adjacent neighbors most closely affected by the proposed development. These neighbors, which include Lincoln Savings Bank to the north and B3 Technology Solutions to the south, responded positively during the visits. 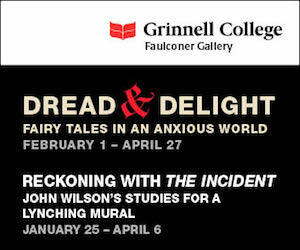 The presentation was informational only, and the City Council took no action following the presentation. Earlier the council supported Grinnell Promenade’s application for Workforce Housing Tax Credits. 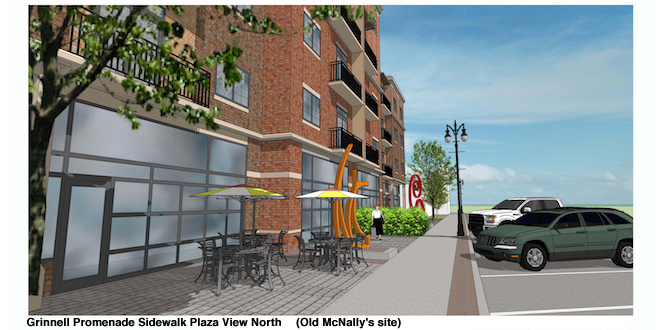 The Iowa Economic Development Authority has notified Grinnell Promenade that the project qualifies for the state credits. Festival of Trees Raises Funds—and Fun!